Preliminary travel forecasts for the looming L train shutdown suggest the MTA and DOT are aiming too low with plans to provide bus service for affected transit riders, according to Walter Hook of BRT Planning International. The MTA’s relatively meager projections for bus ridership during the shutdown, he says, don’t reflect the passenger volumes one would expect from fast, reliable bus service operating on streets that fully prioritize transit. About 225,000 passengers ride the L train across the East River each day, and another 50,000 ride it exclusively in Manhattan. Those passengers will need other options when service between Bedford Avenue and Eighth Avenue is shut down for 18 months, starting in January 2019. But by framing buses as a response to limited subway capacity, the MTA is indicating that it expects those bus routes to be an option of last resort, says Hook, not an attractive, high-capacity service. The effective bus service that Hook has in mind would include transit-only rights of way in North Brooklyn and Manhattan, all-door boarding, and level boarding. Without those features, not only will bus riders suffer from slow service, but the subway system could be overwhelmed by the crush of new passengers. At the Hewes Street and Marcy Avenue stations, for instance, the MTA is expecting large numbers of additional riders, but Hook doubts the stations are equipped to handle them. “The train would have that capacity, but my suspicion is that the platforms and the approaches to those two stations can’t handle those volumes,” he said. And if the transit system is overwhelmed, traffic congestion will be compounded as more people turn to driving private cars and ride-hail services like Uber and Lyft, while other people will simply avoid making trips. “There will be some serious consequences unless they do something pretty bold,” Hook said. Exclusive lanes, all-door boarding, and pre-paid fares are all essential and the city and MTA are asking for trouble if they don’t recognize that. But level boarding? It doesn’t seem practical or necessary to build bus platforms for an 18-month temporary solution. They could make use of the plastic modular boarders they’ve used on Utica to provide level boarding. bolt in platforms in use in some other cities are cheap and practical, don’t require digging up street. and there is a good case for making the solution permanent. The MTA is also making a mistake if they think that the J line can absorb more riders without additional frequency and newer trains. I ride the J daily and the train runs every 10 minutes on a good day. It is almost always standing room only by the second or third stop in from either direction, and I’ve been present when at least once/month someone in my train car got cursed out or in a fight because of issues directly resulting from crowding. The Marcy, Myrtle and Essex Ave stops need to have platform controllers to help with the crush of people at these stops. All of this is in addition to the door and signal problems that frequently plague the line. I’m not sure if anyone at the MTA is riding these trains at various times of the day as part of their planning for the shutdown—but they should. Never let a crisis go to waste. Cute. Just to add to these two responses, the high number of seniors riding buses on these routes (especially 14th Street) makes at-level boarding essential for speedy bus service. I agree! I have been living off of Myrtle/Broadway J train stop for the past five years. When I first moved to BedStuy in 2012, J train rush hour was relatively empty. I feel that as gentrification has pushed folks further east in Brooklyn the J train at rush hour is extremely packed to the gills! Thank goodness I’m comfortable biking to the city! A BRT consultant thinks BRT is the panacea? Color me shocked! Much like Uber suggesting they have the solution, I’m leary of recommendations from those who stand to profit off the pain we’re all going to feel come 2019. You’re leery of recommendations to make surface transit operate as quickly and reliably as possible? If it can be done cheaply and easily, sure. But I’m skeptical it’s as simple as suggested, especially where sidewalk space is limited. I can see it working on 14th, but not for the routes that wind through Brooklyn to provide service for L riders. I think J M service is supposed to increase as part of the plan. I certainly hope so. They need more frequent service now…and the L hasn’t even shut down yet! But BRT doesnt do that… Its a 2 fare system along the river far from the subway created to drive up property values for developers, not to help the vast majority of new yorkers. Not a panacea at all, something that will help. Even if more people take busses than projected the J, M, and G will see huge increases in ridership. 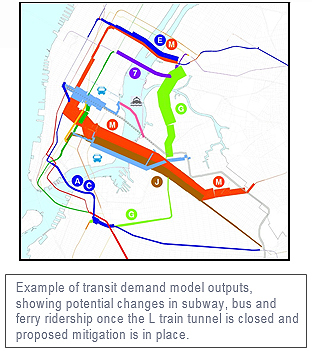 The plan in this case is to run BRT along the route of the L train. I don’t know where you’re getting “along the river” from but it isn’t any solution pitched for the L train shutdown. You’re thinking of the streetcar. Plus about 10 miles of PBLs to support last mile riders. This would cost less than $4 million to implement and likely support about 30,000 daily riders. Take a map and examine closely the distance from L stations to J.M,&G stations, the distances are too far to walk, but a perfect bike jaunt – usually less than 3/4 mile. 2 fare system?! No one is proposing BRT that wouldn’t be integrated with the existing Metrocard fare. This is an MTA service. The M needs to run to Midtown 24/7… they don’t appear to have committed to that one. It’s like Bety DeVos level hucksterism for transit.